with both proofing seats! The crumb is perfect! I'm not a big fan of plastic, but I dislike getting dough out of cloth, too. So I do cover my bowls with plastic, but as long as it can be reused I don't feel too badly. I buy plastic shower caps from the Dollar Store--10 for a dollar and they make great bowl covers for fermenting dough. I reuse them many times. They are big enough to tent over most containers so that the dough never touches, but if it looks like it will be a problem I lightly oil them for easy removal. I know you are looking for something to rest the dough ON while proofing--the reusable plastic mat sounds just fine. 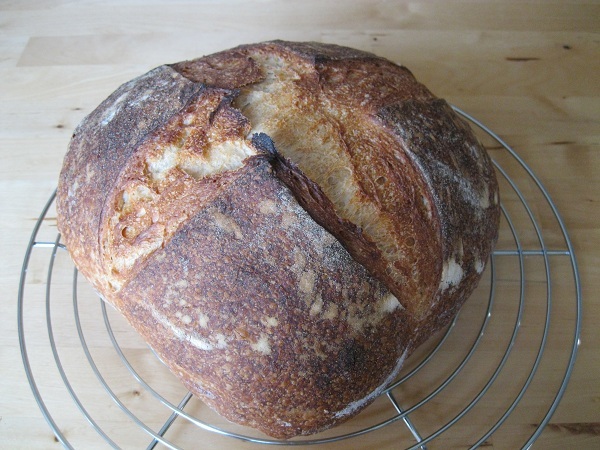 Some people proof boules like that right on their peel, with an ample sprinkling of cornmeal or flour to keep the dough from sticking to the peel. That doesn't work for me because of asthma issues--the sprinkled grain inevitably burns in the oven and bothers my lungs, so I use a piece of good quality baking parchment (silicone coating, unbleached, rated for hotter ovens) cut closely to the shape of the fully risen dough between my peel and the dough. I can reuse that parchment two or three times at least. And if I need to cover a free form loaf on the peel while rising, I use a big empty bowl or pot. 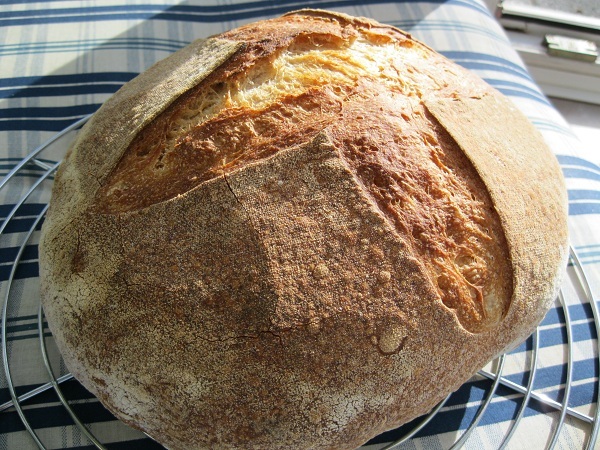 but that's a beautiful boule! If it works...do it. You could avoid the environmental question altogether by getting a nice linen baker's couche - never needs washing, or flouring for that matter (at least, my TMB linen doesn't). to let this go, but I've been revising all my formulas and I'm doing some overnight proofs in the fridge. 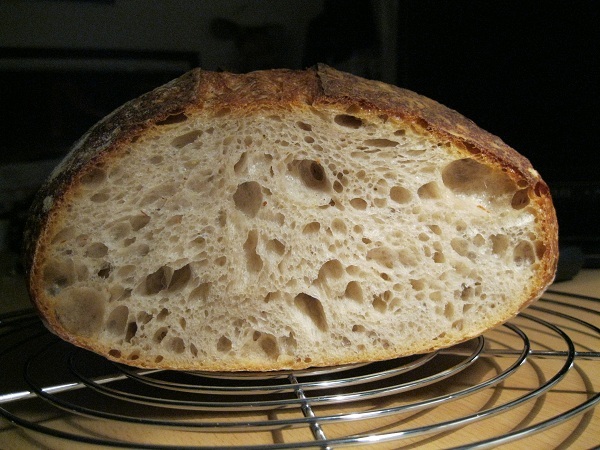 The linen couche is not only very lightly floured, but actually shows wet spots under the loaves. Not a bit of stickage. @LindyD: I wanted to buy a linen couche some time ago, but just couldn't find one anywhere. Untreated and uncoloured linen cloth seams to be a little hard to get. But what about not washing it? Is it really not necessary to wash it? The dough will certainly leave some flour or dough on the cloth (?). @Janknitz: I am really sorry to here about your asthma. Is it in issue with making doughs in general? When working with flour, a lot of it circulates in the air, so I am wondering if that is a problem. I really hope for you that it is not too hindering for you in everyday life. Nice to hear that there are other people who care about plastic waste. I try to reduce this everywhere I can, too. For example, when I buy fresh fruit/vegetables I try to avoid goods that are packed in plastic, but prefer loose ones. 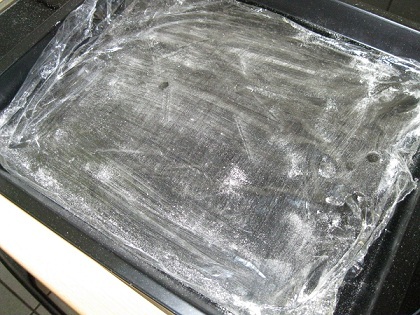 When I am using plastic wrap for baking, I also try to use it more than once throughout the whole process. So if I cover a bowl with wrap, than I later use this wrap for covering the dough for bench rest. If the dough isn't too big, I also use the trick to just cover the dough with a bowl or another comparable object, turning it upside down over it. Thank you for the valuable advice about the shower bags. Seems to be a very good idea. 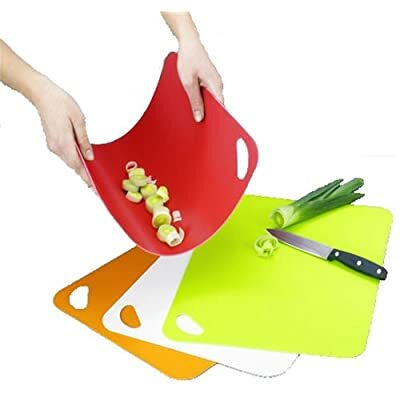 The "proofing directly on the peel"-method however wouldn't always work for me. I usually let my dough proof smooth side down so the seam side has the chance to flatten out on top, and then turn it onto the peel so that the smooth side is up again for scoring. If I don't do it like this, the bread tends to produce a very irregular bottom crust. But thank you for your ideas. Now that I manage to produce acceptable results more constantly, other things like how to efficiently clean your kitchen, using the right materials and surfaces and things like that become more important and worth thinking about. I purchased my linen from a baker's supply here in the U.S. Since you're in Germany, am guessing you would have to locate a similar store. I washed the linen when I received it, but it only needs very light sprinkling of flour (if that), which is easily shaken out before I hang the linen to dry. I guess if I spilled grease or something else on it, I'd have to wash it - but not otherwise. Like you, I always reuse plastic wrap - I just roll it over a cardboard tube and stash it away till needed again. I have to remark again how lovely your sourdough crumb is.